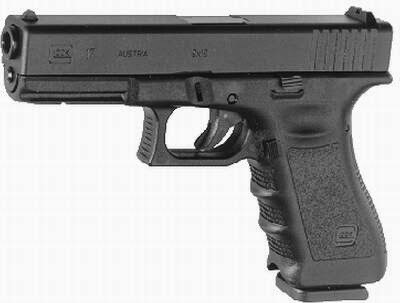 The Glock is 9mm semi-automatic short recoil locked breech pistol having muzzle velocity 375m/s and effective range of fire 50m .The Glock pistol was developed and designed by Gaston Glock in 1980s as per 17 criteria's given by Austrian military thus the name given to it Glock 17. The gun is much lighter compared to its competitors as its body is basically made of polymer. And since it's basically made of polymers , the self life of gun is higher and it remain functional even without getting proper cleaning. Further it's integrated trigger safety is safe and easier to use compared to thumb activated external safety mechanism. The other safety mechanism incorporated in this pistol are firing pin safety and drop safety. Due to above mentioned features ,after it's induction into Austrian military, this gun gained popularity very soon among police of various countries. Later many variants such as Glock 17 ,18 ,19,20 ,16, 29, 34 etc has been developed. Original pistol was made for 9*19 mm parabellum cartridge but later variants uses various kinds of ammunition depending on the variation. Rifling 6 grooves, 1 turn in 250 mm, R.H.